What is a master plan?? This semester, I am working with two School of Information students to assist the City of Jackson, Michigan improve Master Plan Public Involvement. From our interviews and research, we found two key barriers to citizen engagement in master planning in Jackson. First, citizens do not understand the master plan and why they should participate. Second, the cost of participation is very high (attending meetings and design charrettes). In this phase we focussed on solving the first problem by designing an infographic to present the complex master planning process in simple and easy to understand format. 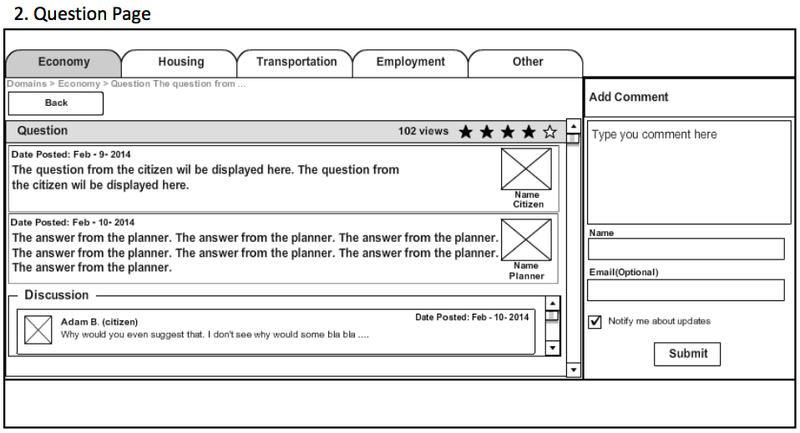 We are also working to create wireframes for Jackson's Master Plan Website. To increase the ability of citizen participation in Jackson's master planning process, we are creating a feedback system where citizens can send questions/thoughts/concerns to the Jackson planning staff and receive an answer from staff planners displayed on the website with a forum below to allow citizens to discuss the topic further. We are in the process of showing these to planners and citizens to get their feedback on both the idea and the design. We would appreciate any feedback you have to offer. What aren't we thinking of? What are your concerns with the online portion?